I have a problem with Japanese restaurant staff: they never seem to know who I am. At Hiroko in my local Kensington Hilton I once pointed to a nice booth for four. The manager indicated a smaller table opposite. We stood in the gangway, neither of us budging. "I'd like to sit there," I said. "That is for four, this table is for two," said the manager. Eventually, I uttered the dreaded words, "Do you know who I arn?". "No," said the manager. "Who are you?" That threw me. But I came back fighting. "I'm a customer who's been coming here for years, well before you got the job, and I always sit at that table," I said, pointing to the booth. That flummoxed the manager and he let me sit there. He's a nice chap: his name is Mohamed Ibrahim, and we get on rather well now. I recently decided to try Suntory,a Japanese restaurant in St James's, once very chic. I rang up. A gentleman of foreign extraction tried to explain the difference between the lower floor, which had Japanese chefs cooking traditionally in front of you, and the ground floor, which was less nationalistic. "Keep a place for me in both," I said. "I'll decide when I get there." "You'll have to book now for the ground floor," said the voice. "It gets very busy." "Do you know who I am?" I said as grandly as I could. "No," said the voice, adding, "but I've only been in the country for two months." No excuse, I thought. A few moments later the manager came on and was more obliging, so we set off for the venue. A very tall, elegant man in evening dress greeted us. 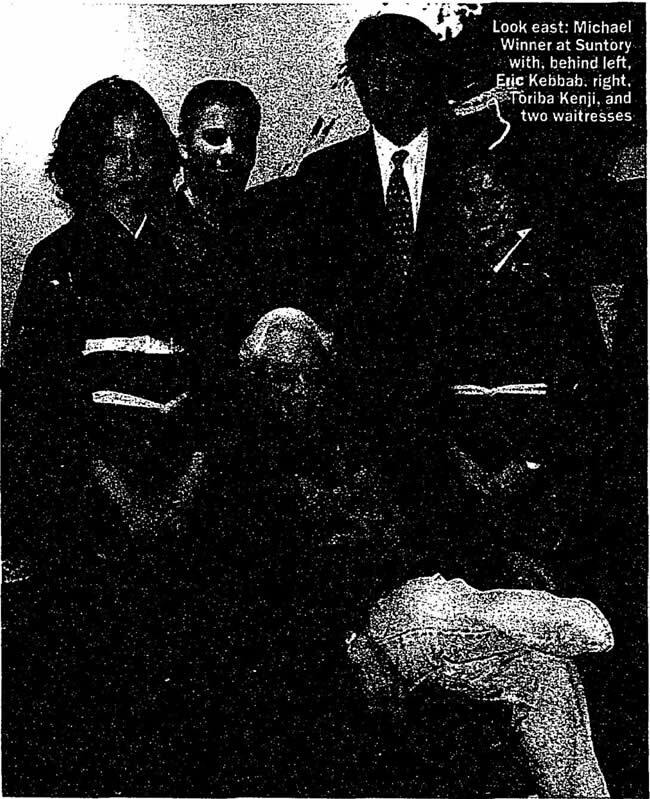 He was the general manager, Toriba Kenji, who used to be in the Japanese basketball team. I chose the upper level and the manager, Eric Kebbab, from Morocco, wearing a smart three-piece suit, took over Winner-minding. Why is it that managers of Japanese restaurants all seem to come from North Africa? Mohamed at the Hiroko is Egyptian; now I have Mr Kebbab. All the guides go on about how expensive Suntory is. "A visit to this most moneyed of Japanese establishments is not for those with only a little ready cash to dispose of," says The Good Food Guide. What then were that group of students doing at a centre table? Or were they millionaires in disguise? There were five Japanese girls: cheaply dressed, charming, giggling. One of them had a violin case on the floor by her chair. Another had enormous ski boots with high wedge heels and soles, like a minified, dumpy, oriental Spice Girl. A white-faced young man in a blue shirt and jeans asked if they knew of the pop group East17. "I live in E17," he said, showing them his address book to prove it. The room looked like the corner of an airport lounge in need of modernisation. Perfectly pleasant, soulless, not chic, but far more nicely proportioned than the hideous, corridor-like Nobu. There they knew exactly who I was and I had a terrible time. At Suntory, I ordered two main courses, a sauteed tempura and boiled eel with sweet soy sauce. There was some excellent soup, then Vanessa got her seaweed salad. "I can't eat that," she said, "it's raw seaweed." Then she tried the other side, which was pink coils of something. She left the lot. "It's good to try these things, isn't it," she said, as Eric rushed up with a small salad. Vanessa thought the dressing vinegary and left that, too. I enjoyed all of my tempura of prawns, turbot, squid and more. The eel came in a black bowl looking like sliced roast duck. It was very nice. Vanessa liked her selection of white fish. The Japanese have odd ideas about desserts. I selected three. Everything seemed to have red bean in it. I ordered green-tea ice cream, jelly without fruit salad, and some red bean hot jam stuff. "Would you like red bean with the jelly?" asked Eric. "Why not," I said. The red-jam soup tasted like soup, but it was a dessert; it had little balls of mochi in it. The jelly was red and green, with a blob of red bean in the middle. It's much crisper than English jelly. I'd have preferred it moulded as a rabbit. It's difficult to get jelly today. In summer, they have it at the Ivy. Bibendum puts it on for me when they hear I'm coming because they know I have sophisticated tastes. I wonder if I could get them to do baked beans on toast with a fried egg on top as a starter. That'd be a nice meal. I was amused to read that blue jeans are acceptable at Claridge's (Style, March 1). Unless they have changed their policy, they are not acceptable to the Rouxs at the Waterside Inn. In 1990, I was staying in London when Bruce Gyngell, then head of TV-am, invited me out to lunch. One of our party, an American, was wearing jeans (smartly pressed) a blue blazer and loafers: rather preppy, hardly grunge. On arriving at The Waterside Inn we were told by the maitre d' that we could not have our table because they did not permit jeans. We left and ate instead at the local pub in Bray, where we had a far more enjoyable lunch and were able to watch a game of cricket being played on the adjoining green. Some years later, I again found myself at the Waterside Inn and a lady member of our party asked if there was any chance of a table by the window. "I am sick of you Australians coming over here and demanding the best tables," said the hospitable Robin Roux. The last time I had seen her, she was a waitress in a restaurant in north Sydney, and far more polite to the diners. Perhaps they could publish a rule book so that the uninitiated do not unwittingly commit these transgressions. Having read one of Michael Winner's recent columns, I passed the paper to my girlfriend as, like him, she is somewhat forthright. After reading the piece, she asked whether Mr Winner was the gentleman in the picture wearing the short-sleeved shirt. I replied that this was indeed the great man. Her only comment was: "Well, anybody who dresses like that has got no business pronouncing on matters of taste." Can Michael Winner explain why establishments such as the Sugar Club (Style, February 22) buy red emperor fish from Australia instead of using the multitude of fabulous fish available from around our own coasts? God knows when the red emperor last saw the sea.